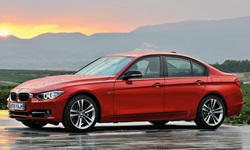 BMW 3-Series TrueDelta Reviews | Page 1 of 1 | Why Not This Car? You'll be living near some of the best roads in the country for a month, specifically those of western North Carolina. You can drive four different cars during this time. Would you make one of them a wagon? For over 30 years, the BMW 3-Series has been the compact sport sedan everyone else has been gunning for. For 2012, the sedan has been totally redesigned. Has BMW once again raised the bar? Or have they lost their way, perhaps even choked?